The BBC was recently given a guided tour of Google’s Android mobile OS – the so-called GPhone – by Google’s Director of Mobile Platforms Andy Rubin. The Android “software stack” is currently an Alpha, meaning that the software is still in the very early stages of development, and was shown running on a prototype 3G-capable touchscreen phone developed by one of Google’s hardware partners. Rubin started by demonstrating the GPhone’s Web browser (based on the same WebKit source code as Apple’s Safari), which, although very iPhone-like, doesn’t zoom by double-tapping or “pinching” but instead a “tap and hold” brings up an overlay menu with zoom controls. 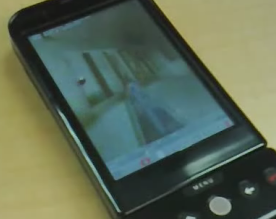 Next up, Rubin showed off the “first person shooter” Quake, which ran with the help of a separate 3D graphic chip included in this particular GPhone reference design. Finally, Rubin demonstrated Google Maps Street View, which gives panoramic views of locations found on Google Maps, something that isn’t currently available on any other mobile version of the software. Sounds and looks like great technology. I read an article on Android OS in Wired, but haven’t seen it in action. Hopefully, I will get my hands on it in a near future.